A couple new Layering Stencils were released last week, Holly Bough and Harlequin. Gosh these will be great for holiday projects! Today I am working with the Harlequin pattern. I decided to make a Christmas card since this is about the time of year to get starting. I tried to pick products that are easy to use and come in multiples so you can easily replicate the card 5, 10, or 20 times. Start by adhering white cardstock to a piece of chipboard. Cut into squares and run through the Vagabond machine using the Sizzix Ice Skates Bigz die. Cut one skate per card being made. Cover all skates with Crackle accents and set aside to dry (I did not cover the skate blade). Once dry, rub Distress Ink into crackle finish. 1. Thread string through needle. 2. Thread the string through the bottom hole - even out the string. 3. Work your way up the skate, skipping every other lace hole. 4. Starting at the bottom with the other end of the string, work your way up the skate, crossing over the first string. 5. Tie the string into a bow at the top. I wrapped the string around the boot a few times and then tied the bow. Either way works. 6. Paint the heal of the boot with a thin coat of brown paint. Use your finger tip to rub the paint into the crackle in the heal. 7. 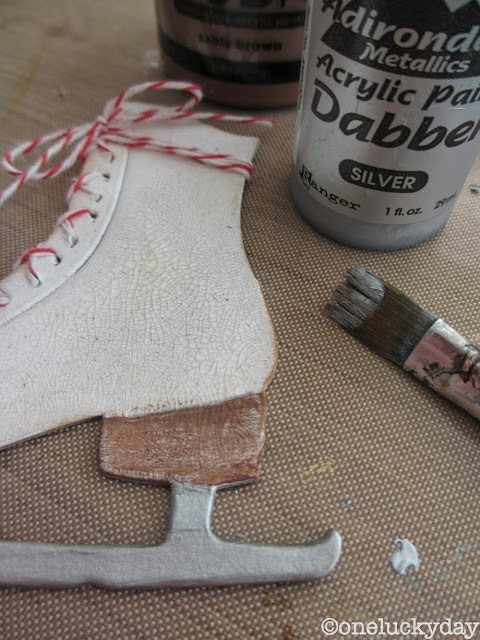 Paint the skate with silver Adirondack dabber paint. 8. Add a thin coat of Glossy Accents to the skate and sprinkle with Pumice Stone Distress Glitter. Set aside to dry. Cut a piece of Ranger Manila cardstock for a card front. Using the new Harlequin stencil, add Barn Door Distress Ink to the cardstock with a Blending tool. Because the cardstock was wider than the stencil, I just slid it over, lined up the pattern and began coloring the rest of the cardstock. Until the entire cardstock is covered. Wipe off the stencil with a wet wipe. Super easy clean up. Once clean, line up the stencil over the red pattern. This time color the open area with a combinations of Forest Moss and Peeled Paint Distress Ink. Again, slide the stencil over to color the remaining area. Ink the cardstock with Frayed Burlap and the edges with Walnut Stain. Cut a piece of Core'dinations cardstock to use as the card foundation. Set the card to the side. Add the large Sized Oval to the center of the Cameo Frame Bigz die. Cut a piece of Merriment paper and run it through the Vagabond machine. NOTE: I should have adhered the paper to a piece of chipboard before I cut it but I didn't, so I cut the chipboard separately and then glued the two together. Add the Cameo Frame and the Ice Skate to the card front. Pick three Christmas words from the Holiday Chit Chat stickers in either white or kraft. One book of will make a lot of cards! Cut the ends like a flag and add to the card front. Color a mirrored star with Meadow Alcohol ink. Add a touch of gold mixative over the green. There are 24 stars in 5 sizes in one pack of Mirriored stars...plenty to go around. NOTE: If you plan to color the stars in one color - Drop the stars into a small plastic bag. Squeeze a small amount of the desired Alcohol Ink into the bag. Close the bag and rub the color around till the stars are coated. Dump out onto a craft sheet and wait a minute or two to dry. Now they are ready for a bit of gold over the top. 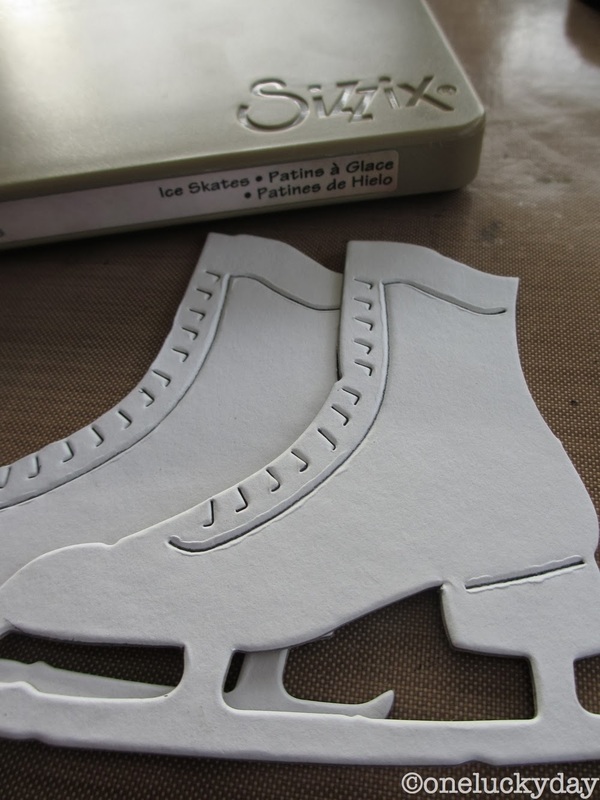 Add star to the ice skate with a bit of foam tape. I used the center that was leftover when I cut the Cameo Frame/Sized Oval for the inside of the card. I also used the Harlequin Layering Stencil and Forest Moss to add a little pattern over the top. A Christmas Word band and a Vial Label finish it out. The Christmas Word Bands come with 12 different saying in one package - all appropriate for Chirstmas wishes. So 12 cards per package! Hope this gives you some ideas for using the Harlequin stencil to create cards or tags. My friend Richele Christensen has a fabulous Christmas card on her blog using the stencils - check it out here. As a little bonus - I'm giving away 2 of the harlequin stencils! Leave me a comment and I will post the winners on Friday! Beautiful card! And I would love the stencils--actually I want all of them, but I'd love to start collecting them with the harlequin one! And Merry Christmas to you! Wow! I'm no 1 .... Love this card. Now I need the skates die! Love how you used the crackle paint on them with the glitter. Another fabulous project Paula. Thanks so much. ... and yes, I need that stencil ... right! Love the crackle paint on the skates. The card is so cute. I love my layering stencils and these new ones are wonderful! Loving the card and thanks so much for the chance to win! The card is fabulous and love how you've used the stencil to create the two tone colours. ooooh, I would LOVE to win a stencil! Thanks for the chance. Yes,you are right.I want one. :) Thank you. Beautiful card Paula! 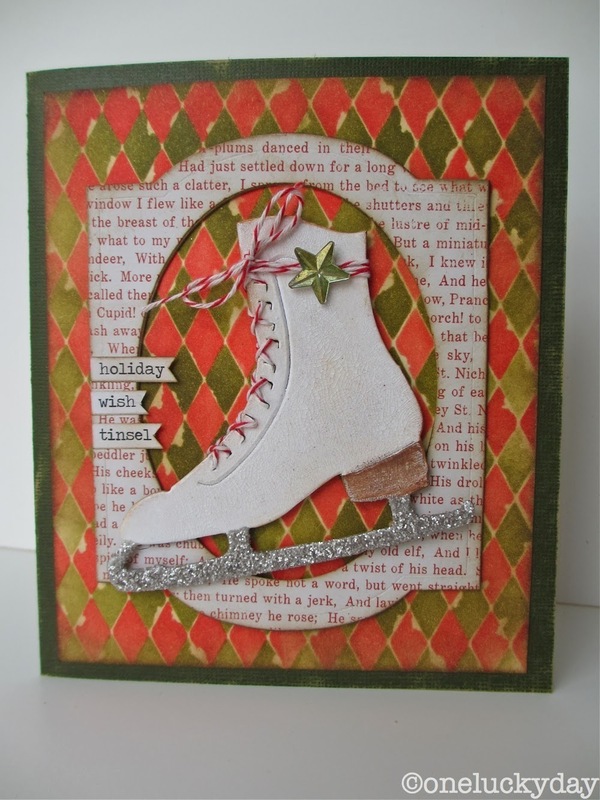 Love your inky double stencilled background and the ice skate look wonderful with the crackle and glitter. I love your card and they way did it. Loved how you used the stencil as a mask as well. It got me thinking of different color combos that would look great for other holidays. What a fun card! I really like how the harlequin stencil works! How adorable is that ice skate!! Love it!! cute card. Love Tim's new stencils. All of them are on my wish list. :) thanks for a chance to win one of them. Beautiful card, and the tim holtz new stencils are great. Only they sold out everywhere in the Netherlands, i am waiting so long now. grrrrr. Such a pretty card I love the ice skate. I would love to win! Loverly! And since I already own both stencils (thanks to my friend Donna Gibson!) should you pull my name outta the hat, please pick another. Pay it forward as it were! I absolutely adore this card! The skates are so fun. Great tip for creating the 3 color background. And um, yes, of course I want the new harlequin stencil! Thanks for the inspiration and the giveaway. I just bought the skate die and now I have no excuse not to make some of these cards. You are so talented. Thanks for all the inspiration. I love the card, inside and out! You've given me some great ideas for using the skate die. Thanks for the inspiration. Love your idea with the skate, I used it for my cards this year, but now i'm really wishing I hadnt finished them as I love some of your ideas. Oh well I'll tuck the ideas in the back of my head to use on a future project. Oh, yes! I want one! 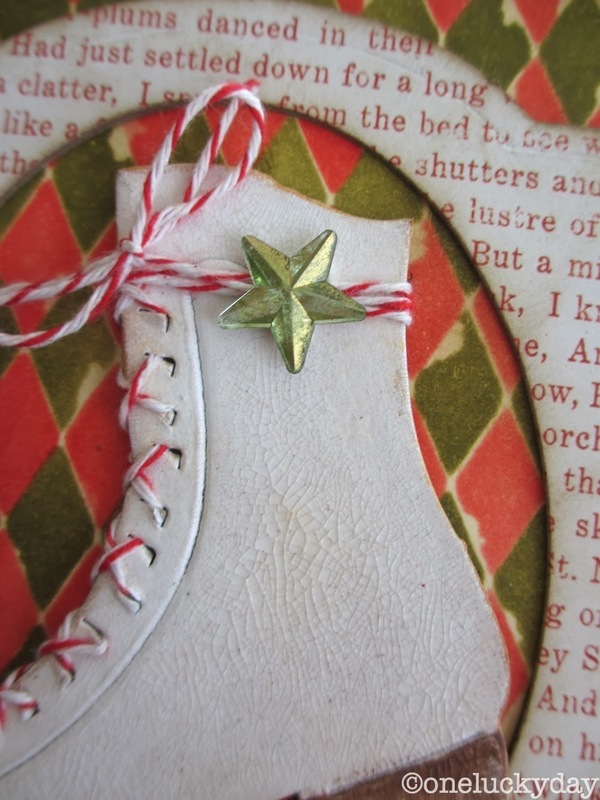 I love this card and I can see that it would be fairly easy to make several at the same time. Love the whole composition of this!! Very cute and simple to do! Very lovely card! The skates are awesome!! Great project. I like how you used the harlequin stencil! Love the tutorial! I'm just getting started with my holiday cards, so this is perfect timing. Cute as ever. I love the ice skates with the glittered skates. Awesome! I've been lurking looking for holiday inspiration from you! Love how you used the stencil for both colors - beautiful! Crackle accents - wonder if I still have some of that - love the effect on the boot! Love that card & yes, how did you know that I want that stencil ?!? Great card. I'd love to have one. Thanks. Love the card. Thanks for showing the best way to lace the boot. I will be using your directions. The stencil is so perfect. Thanks for the chance to win! yep - you know it - would love the stencil! LOVE THIS - the skate looks great! Good job! Love that card! I've been looking all over locally for the Layering Stencils (unsuccessfully) so would love to have this one to start my collection. Thanks for the chance to win! Love that card. Such a cute skate with so many details. I love how you used the stencil in the background! So fun. Your use of the crackle on the skate is just perfect...looks like aged leather. The harlequin stencil has so many possibilities. A must have for year round creating. I just love the whole concept of harlequin stencil portrayed here. You have talent. How smart! I love that you used the stencil twice to give the bold pattern. And thank you for showing how to lace the skates. I've botched several pairs trying to lace them up. So beautiful and creative. Thank you for the inspiration. Happy Thanksgiving. Oh, I just love this! I might recreate this entire card for a good friend's daughter who is off in Germany in the service. She was a champion figure-skater in high school and college. She would just love it! That skate is so cute all by itself, and you used it to make a great card! As always Paula this card is so stinkin' cute....(every once in a while I channel my 21 year old daughter...lol). I love seeing all the ideas for the ice skate which i just love. And a holly stencil. Be still my heart. Can't wait to make some simple and fun cards with these. Thanks for the inspiration. Beautiful card, love the layering with the harlequin pattern. The variations in the colors add so much depth and dimension to the card. Gorgeous!!! So many great little details…that background makes it all pop! Thank you for the inspiration!!! You always give so much inspiration...thank you! VERY inspirational! good idea to use the stencil in 2 colors over each other! what a fun card - i love how you did the skate! and i'm going to have to find some of those christmas word bands. I love both cards and the different ways you used the harlequin stencil. Fun techniques, nice card, and love the harlequin stencil! I love that you use the scraps inside the card. As always amazing work, Paula! I love your skate so much, that I just have to order that die! Thank you for this great tutorial ^.^ The card is gorgeous ! WOW! The skates look great and the stencil is fabulous! You do the best step by step tutorials. thanks for showing us how you created this fabby card. And yes, I would love to win a harlequin stencil! Thanks for the chance. I did not think I needed the harlequin background until now!! This card is fabulous!!! Gotta get those two stencils!!! Beautiful card Paula. I just love the harlequin stencil. Watching you create this amazing card and seeing how you used the harlequin stencil made me gasp. What an imaginative way. fabulous. Paula, I love the card... a lot of work. But, oh so worth it! Paula, You have the best ideas! Love it!! I love how you were able to use the stencil as a mask in order to get two colors in your pattern. Brilliant! Background is awesome. Really like the simplicity of the card. Thank you for sharing! I love the ice skate die !! Your card is so adorable .. those stencils ROCK !! Love the new Harlequin Stencil! 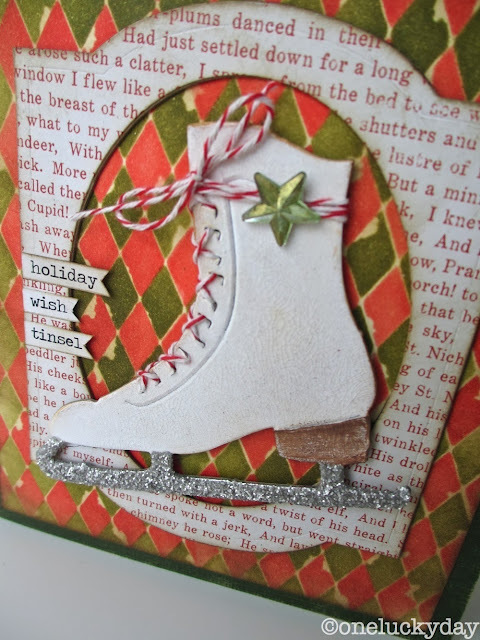 I was not thinking I needed that ice skating die, but I so love how you worked it into this fabulous card! The background looks wonderful with the Christmas green and red! Love this and thank you for a chance to win! I love those skates. What great ideas and of course we all want the stencil!!! I loved the detail on the card. The harlequin stencil work was great. Thanks! oooo, Paula....love the look!! The stencils are a wonderful way to "build"!!! Beautiful! I always love your work. You are such an inspiration! I always love your detailed projects...thanks for the chance to win the stencil!! I really like the way you used the stencil to paint the two different colors. I'd love to have the stencils. I am inspired! I love all the details. I am in love with these stencils! Hi Paula. Fab card. Iloe the ice skate. Take care. I have had crackle accents for years and have never used it. Now I will, I hope it still works. Your card is amazing, as is everything you do Paula. I love how you shifted the stencil and filled in the whole background with color. Wish I could attend your classes here in Florida at Whim-so-doodle. Unfortunately those days are already booked for me. Boo-hoo! Thanks for today's inspiration. Love the card so festive. You have great ideas and love looking at all your beautiful works of art. Lovely card! I adore harlequin patterns too. Thanks for the giveaway! Love all that you do Paula!! Another great project, thank you for the inspiring me this morning. Love this, Paula! You always come up with a "WOW, what a great idea" post - the double whammy from the harlequin stencil was this one - shift it over the first color and do the next color - brilliant! Fabulous card! Going to try! Great card! 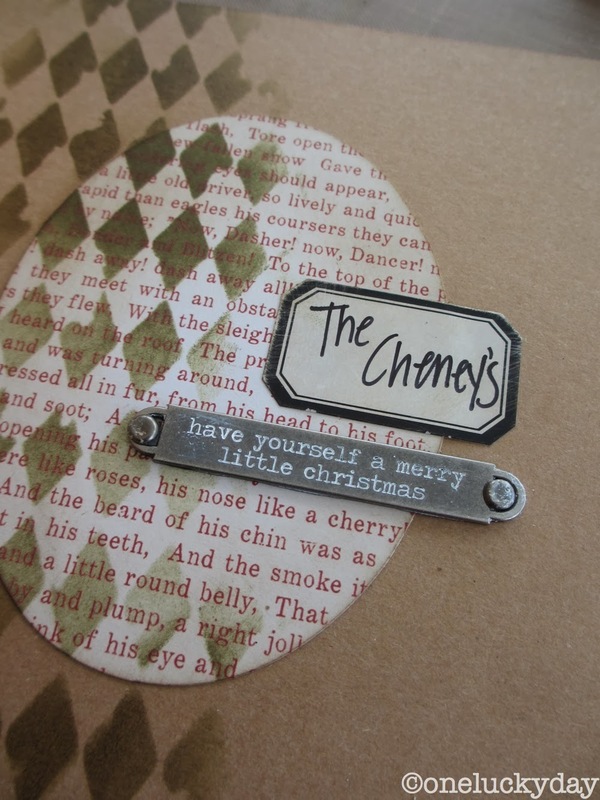 I love Tim Holtz anything but would really love to use these stencils on my holiday cards! Thanks for the design and techniques! Thanks for sharing your card. I never thought to cover the already stenciled part and use another color. Can't wait to try this. Love the harlequin stencil...you can use it on everything and anything! Love the 2 color technique you did on this skate card. This stencil is an absolute MUST have in my opinion! I was clueless also in using that stencil to color both negative and positive spaces! Thanks also for the tip to mass dye the stars; that star was the crowning glory to your pretty card. What a beautiful card. Love the way you did the skates- just perfect. Now I need that die and of course the stencil. What a beautiful card! I love the way you used the new stencil, and the ice skate die is so cute! Thanks for the inspiration. You're right, these new stencils are amazing. Love your card, you did a wonderful job. Heck yeah we want one Paula! If we didn't want one before after seeing your card we want it :) That card is fabulous, love the techniques with the stencil... so cool and the skates OMG so amazing !! You KNOW I want one! Wonderful card Paula. Just when I think I don't NEED another thing and look what you go and do!!!!! Really love what you did with the skate and the background stencil is perfect for it! Beautiful. You really duplicated the "feel" and "look" of the real leather ice skate! Utilizing the harlequin stencil also added the vintage-look for me! I'd love to try it. What a great card, a work of art for anyone who receives it. I like how you used both red and green with the stencil. And your skate is over the top. Thanks for sharing and for the giveaway. WOW!! LOVE the card you made!! Thanks for taking time to post all the step out photos! YES...I NEED a harlequin stencil!!!!! I LOVE your card and i love those stencils. Need to have them. I love the new stencils and particularly the way you added different colors to make it look like argyle, how about stockings? Anyway we don't have any stores around here that carry these stencils. I will suggest to them to carry them, mean while I hope I win! thanks for sharing this awesome card. You have done a beautiful job highlighting the new layering stencils. I only hope they will be available soon enough in the local stores so that we can use them on holiday projects. Here's hoping I can win one so I don't have to worry about that. 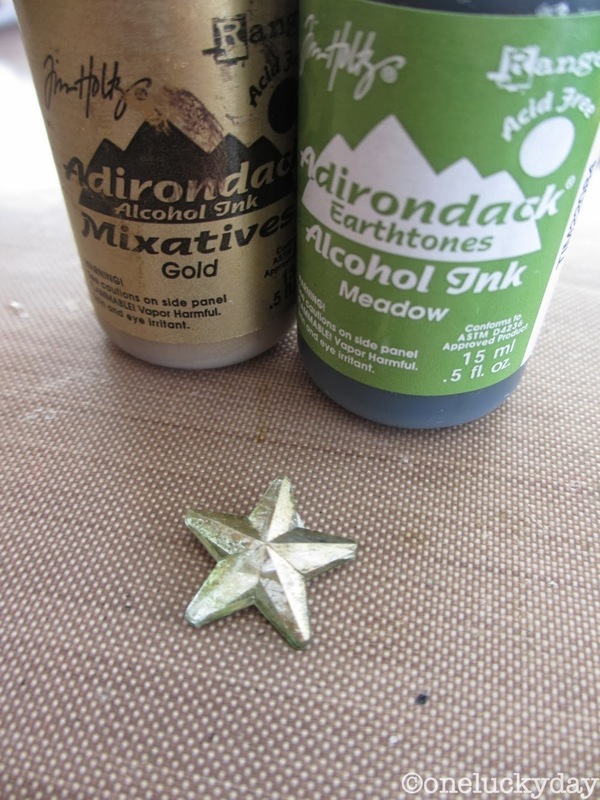 I love these stencils and have many uses for them. Love how you used them. Wow! I love the old-days combination of colours and motifs...just love it! It would be great to have the stencil (it would be the first from the new series). Love the way you patiently show your work step-by-step. Thanks. Great card, it is very beautiful. this is such a great card! I love the way you did the star! Really loved the card, that is a great idea...now I need to get one and try it out! Thank you for sharing. Oh, thank you!! the tutorial with the skates are fab!!!! Your use of stencils are also very, very nice. Like it a lot:)) Have a nice day! SO CUTE!!! Thank you for sharing your Skate technique....I just love these stencils - Missed the Carson Rubber Stamp Show therefore unable to purchase these stencils so am hoping I may win your giveaway set of these.....Thank you for the chance and for the tutorial. What a great job of layering different elements and that skate is awesome. I love this card. Thanks for sharing. I wish I learn how to skate ....your card is just awesome! Beautiful card, love the look of it with the harlequin background. Neat to see how you finished off the inside of the card also. Hope you and your family have a Happy Thanksgiving! HOHOHO|!!!! LOVE the harlequin and the holly stencils! you really made that skate fabulous! Wow, I love how you put all the elements together! Every time I flip though the blogs I always learn something new. Would never have thought to use the crackle paint on shoes, or in this case skates. Happy Thanksgiving to you and your family. I am so glad tim introduced me to your blog! Your card tutorial was really well done and the skate is great! Fabulous card! Thank you for sharing! What a beautiful card! Shows a lot of love! Wow, what a fun card. 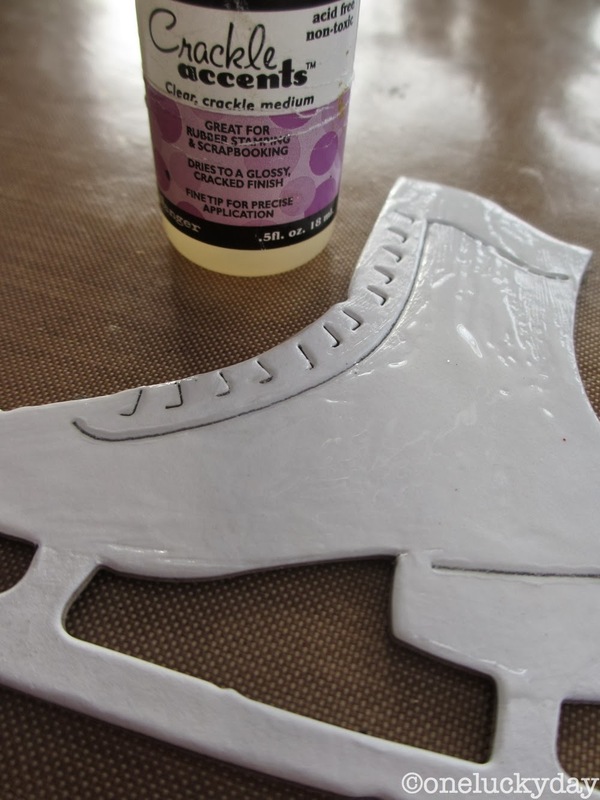 I love how you treated the ice skate and your use of the stencil was just awesome! Love the project ... and thank you soooooo much for the lacing directions. I struggled with that on my previous projects. And in real life as a kid with skates ... lol. HO HO HO!!! This card is wonderful! That skate is perfection! Those skates look exactly like the ones I had as a child.......what great memories & festive feeling your card invokes. Great, now there are a few more items I must purchase! love this! I would love to have a set of stencils....what fun! lots of awesome techniques & great card! Thanks! Wow didn't know Harlequin could look so good, you did a fabulous card with the stencil with wonderful instructions! wow, did this ever take me back. that's about what my skates look like now after 40 years of neglect. great card. love the cute phrases. I love the card♥ Thank you for sharing how it was made! Oh, Paula! I would love to receive a card that someone put so much time into. Wow! It's beautiful. These new stencils are amazing. I would love to win this giveaway! I can think of so many ways to use these particular stencils. Not just for Christmas either. They are so unique and I love the size. Hope you have a great Thanksgiving! Your projects are always so lovely and always look so easy! I love how you laced the skate with baker's twine! What wonderful card ideas you have! I so need to get started on mine! The wonderful stencil might just inspire me to get going! Love this card and the easy photo instructions..now I need to get the Ice Skates die that I keep passing over so I can make this! Thanks for the chance to win! I love the beautiful vintage/retro feel you created with the stencil and all the other elements you used on this card, thanks for the chance to win this stencil as well. You have suh grat ideas! Thanks for sharing them with us. Great card and I would LOVE to win a stencil! I adore this card and how the stencil created such a fabulous background for the card!!! I have the skate and stencils on my wish list...Maybe Santa will come early ! :) Happy Holidays !!! Paula I truly love your style and inspiration and how you take the simple elements and turn them into something fabulous----love love this card! Thanks for the chance to win this fab new stencil! Oh my, what an awesome card you have created with the Skate die and the Harlequin Stencil! I'm sure your friends and family look forward to your holiday card!! I'd love to get my hands on that stencil and would be honored to win one from you. You're so sweet. Thanks for sharing! Happy Holidays!! Awesome card Paula! I would love to win the Harlequin stencil from you. Your projects are such an inspiration to me. I just love the instructions and pictures you provide us all with your projects. Thanks for sharing with us! Oh just so gorgeous !! You are right. I would love to have one!! I love everything of Tim Holtz!!! Beautiful card, Paula! Love the new stencils and Skates die. It brings back a lot of winter memories for me. The little town I lived in in Nebraska would flood a low lying area next to a fire hydrant and turn it into a skating rink. What fun my girlfriends and I had there! my friend just bought the skate template, while vacationing in the U.S.A.....oh, I'd love to have these stencils + a couple other items, so I could case your card; it's a beauty!! TFS!! I love this! Thank you so much for sharing the how to. Fabulous card! Would love the stencil! I really like your card--the ice skates are so pretty! Thanks for sharing and a chance to win. You always inspire me! Loved how you used that mask in creating the background with the two colors. Such a beautiful card! How cool! The overlay technique is one that could be done with so many of Tim's new stencils. This is so 'Paula'. So much attention to detail. Beautiful, just beautiful. I just love the overlay technique used to create the background. This is such a perfect card for winter. You always have such great ideas. thanks as always. Paula, what an amazing card!! I LOVE it!! OMG, your card is amazing!! Love the layered background you created. Love your card! Great tutorial also. Would love this stencil. Thanks for a chance to win. Absolutely beautiful Paula and I LOVE how you made that skate look, awesome! Wonderful card. Love the way you used the stencil to make the red and green background. Great tutorial too! Thanks! Paula, just wanted to say thank you for showing us how to make this great card.